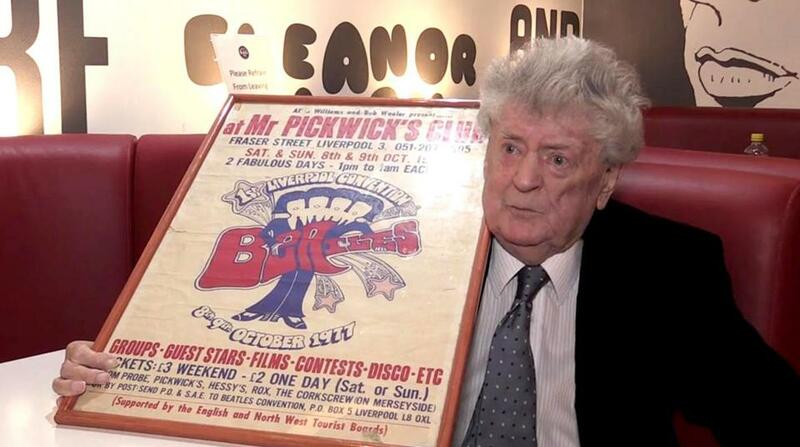 Allan Williams also played a role in the Beatles’ early history as the owner of the iconic Jacaranda pub in Liverpool. NEW YORK — Allan Williams, the stocky Liverpool, England, club owner and impresario who, as the first manager of the Beatles, played a crucial role in the group’s transformation from a mediocre local dance band to the hard-rocking ensemble that mesmerized the world, died Friday in Liverpool. He was 86. His death, at a nursing home, was announced by the Jacaranda Club, the coffee bar that Mr. Williams founded in 1958. Mr. Williams’s main contribution to the Beatles’ development was arranging for them to become the house band at the Indra, a small club in Hamburg, in August 1960. It was a decisive turn in their career. At the Indra, and later at other Hamburg clubs — the Kaiserkeller, the Top 10, and the Star Club — the Beatles played long hours that forced them to quickly expand their repertoire and hone their stagecraft. Before Hamburg, the Beatles’ reputation among Liverpool musicians was so dismal that another band that Mr. Williams had sent to Hamburg begged him not to send the Beatles, on the grounds that they would ruin the reputation of Liverpool bands. When they returned after 14 weeks in Hamburg, their playing was so tight and hard-edged that listeners who had previously been dismissive were aghast. Even before he began managing the Beatles, in spring 1960, Mr. Williams had played a role in the band’s early history as the owner of the Jacaranda. He had become friendly with Stuart Sutcliffe, a promising artist who was John Lennon’s closest friend at the time, and enlisted him and Rod Davis — a former member of the Quarrymen, Lennon’s first band — to paint murals at the club. Lennon, Paul McCartney, and George Harrison, all of them still teenagers, soon began whiling away their afternoons at the club. Sutcliffe later became the Beatles’ first bassist. It was at the Jacaranda that Lennon wrote one of his earliest songs, “One After 909,” and it was there that Ringo Starr, then a member of a far more successful Liverpool group, Rory Storm and the Hurricanes, first heard the group he would eventually join. In 1960, when Mr. Williams began to dabble in promoting local bands like Cass and the Casanovas and Gerry and the Pacemakers, Lennon asked him to do something for his band, which was then performing under several names and lacked a drummer. Mr. Williams enlisted Tommy Moore, an older drummer whose taste ran toward jazz, to round out their lineup and invited the group to play at an audition he had arranged for Larry Parnes, an agent in London who was looking for a backing band for one of his stars, Billy Fury. Parnes and Fury agreed to sign Lennon’s band, which had taken the name Long John and the Silver Beatles just before the audition, on the condition that it replace Sutcliffe, whose bass playing was rudimentary. When Lennon refused to jettison his friend, the job fell through, but Parnes had another offer: If the Silver Beatles, Sutcliffe included, could leave immediately, they could back another of his singers, Johnny Gentle, on an eight-day tour of Scotland in May 1960. They agreed. It was their first tour as professional musicians. But it proved disastrous and led to Moore’s departure. The group found another drummer, Norman Chapman, but when he was called up for national service, McCartney took over on the drums, with Lennon and Harrison occasionally filling in. Soon Mr. Williams offered them the possibility of a trip to Hamburg, provided they find a drummer. They hired Pete Best, a relatively inexperienced drummer they knew from the Casbah, a Liverpool club run by Best’s mother. Best’s audition was held at the Blue Angel, another Liverpool club that Mr. Williams owned. Between the Scotland and Hamburg trips, Mr. Williams presented the Beatles at the Jacaranda and arranged for them to perform elsewhere around Liverpool. Among their jobs during this period was providing music for a stripper at the Cabaret Artists Social Club, another of Mr. Williams’s ventures. Allan Richard Williams was born in Bootle, a Liverpool suburb, in 1930. His father was a dance promoter in Liverpool. Originally a plumber, Mr. Williams left that work to become a club owner shortly after he married Beryl Chang in 1955. When Mr. Williams opened the Jacaranda, in 1958, he engaged the Royal Caribbean Steel Band, led by Harold Phillips, a Trinidadian calypso musician who performed as Lord Woodbine, to perform nightly. When members of the group defected to play club dates in Hamburg in early 1960, Mr. Williams traveled there to see whether he could sell other musicians to Bruno Koschmider, the club owner who had hired the steel band players. Mr. Williams was a rock music fan at the time. When he noticed that the American rockers Eddie Cochran and Gene Vincent drew large crowds to several shows at the Liverpool Empire, he contacted their agent, Parnes, with the idea of promoting a big rock show at the Liverpool Stadium. Cochran and Vincent would top the bill, with other artists represented by Parnes and Liverpool bands filling it out. Cochran was killed in an automobile crash shortly before the concert, but the show went on and it was a success, whetting Mr. Williams’s taste for rock promotion and leading to his involvement with the young Beatles. Although the trip to Hamburg proved to be the making of the Beatles, it was the unmaking of the relationship between Mr. Williams and the group. While in Hamburg, the Beatles had negotiated a return visit in 1961, and because they had done so without Mr. Williams’s involvement, they decided there was no need to pay him a commission. Mr. Williams threatened a lawsuit and did his best to blackball them among Liverpool concert promoters. But they were already too popular for other promoters to boycott. After his split with the Beatles, Mr. Williams continued running his clubs and promoting Liverpool bands. In 1971, he helped present the first Beatles convention in Liverpool. He went on to build a sideline career as a speaker at Beatles conventions and festivals around the world. He published an autobiography, “The Man Who Gave the Beatles Away,” in 1975, and was involved in the release in 1977 of an album of informal live recordings of the band’s 1962 performances in Hamburg. The Beatles sued, successfully, to have the recordings taken off the market.